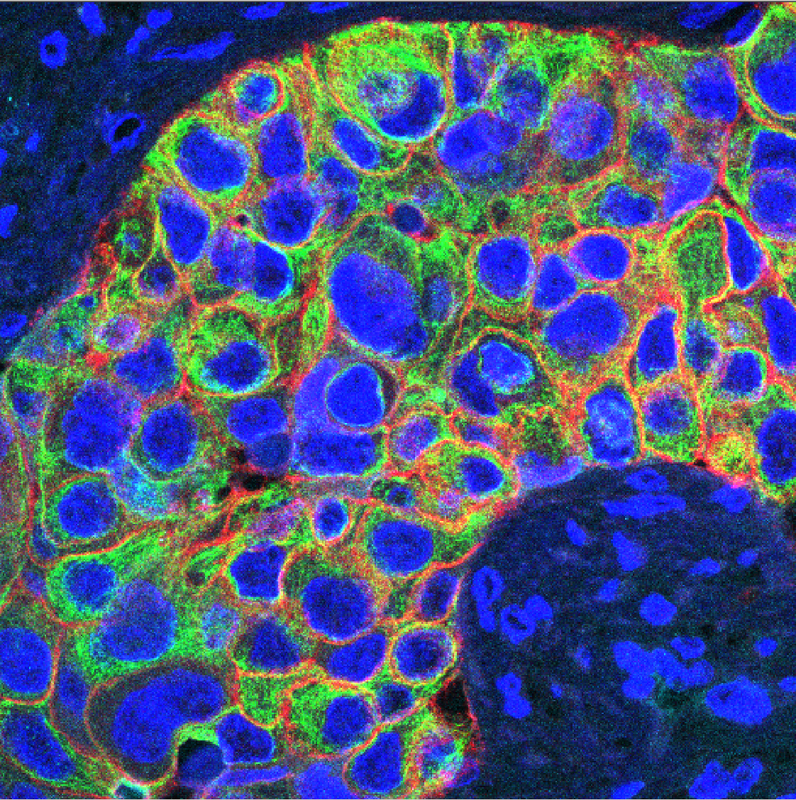 This microscopy section of a breast cancer tumor is stained with fluorescent dyes revealing growth factor receptors in the cells. Growth factor receptors are key players in development and progression of cancer. The nuclei are dyed blue. The green color, which immune-stains cytokeratin, identifies the cells as epithelial (surface tissue) in origin. Cells positive for Her2, a growth factor receptor that is amplified at the gene level in approximately 25 percent of breast tumors, are immune-stained red. Her3, another epithelial growth factor receptor, is immune-stained turquoise. This particular tumor has minimal Her3 and abundant Her2, indicating that this patient would respond to treatment with the antibody trastuzumab. Image courtesy of Monica Reinholz, Ph.D., Vivian Negron, and Wilma Lingle, Ph.D. Read more about how Mayo researchers are trying to starve cancer and about predicting breast cancer risk.